Strong Kirchheimer lines up for a return. The senior is Northwestern’s only representative at the ITA National Indoor Championships, beginning Thursday. The spotlight will be on senior Strong Kirchheimer this weekend as he takes on the top college players in the country at the ITA National Indoor Collegiate Championships in Queens, New York. 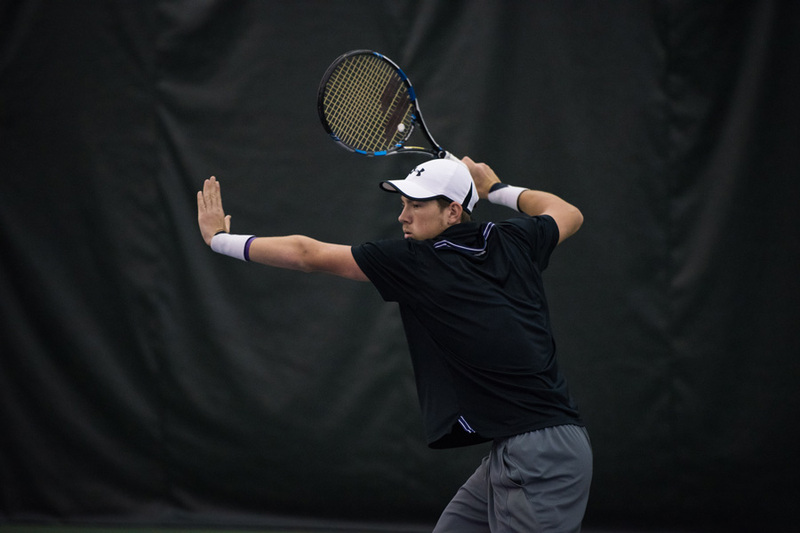 Last year, the only Northwestern representative at the national indoors was current senior Konrad Zieba, who lost in the second round of the tournament. Zieba failed to qualify this year, however, withdrawing with an injury in the quarterfinals in the regional tournament. With Zieba out and fellow senior Sam Shropshire also not in the lineup, Kirchheimer will be the lone member of the team’s trio of senior stars in action, looking to continue his string of impressive play. While Kirchheimer heads to New York with associate head coach Chris Klingemann, head coach Arvid Swan will be headed to the Big Ten Singles and Doubles Tournament in Madison, Wisconsin, with four of the younger players on the team. Sophomores Michael Lorenzini and Jason Seidman will join freshmen Dominik Stary and Chris Ephron as NU’s entrants in the tournament. Lorenzini may have earned his spot in the singles lineup when the team season begins in the winter with his impressive performance at the ITA Midwest Regional tournament, where he made the quarterfinals and took out the No. 5 seed. As Lorenzini looks to build on his performance, Seidman, Ephron and Stary will look to improve on their performances from the regional. Both Seidman and Ephron were eliminated in the first round of the tournament, while Stary was seeded 13th but lost in the round of 32. Meanwhile, Lorenzini and Seidman will be looking to improve on their performances from last year at the conference Singles and Doubles Tournament, where Seidman managed to win a single match and Lorenzini made it to the round of 16. With the best players in the country in New York for the weekend, the competition should not be as stiff in Madison.